Favorite Bible Verse: “Ask and it will be given to you; seek and you will find; knock and the door will be opened to you” Matthew 7:7 and “I can do everything through him who gives me strength” Philippians 4:13. Favorite Adoption Story: I have had the privilege of being a part of many adoption stories, professionally and personally. Each story is unique and beautiful. The most beautiful story is how our Heavenly Father, Creator of the universe, adopted all of us as his sons and daughters. Education: Regina holds a Bachelor’s and Master’s degree in Social Work from Missouri State University, and is a Licensed Clinical Social Worker. 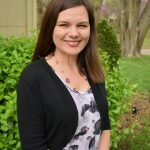 Responsibilities: Regina is a birthparent counselor and home study provider in Southwest Missouri. She serves both birth parents and adoptive families throughout each stage of the adoption process. Regina currently resides in Springfield, Missouri with her husband and two children. Regina enjoys spending time with her family, being outdoors, attending sporting events, and church functions.